Don’t have time to complete a book in 7 days or during a weekend? Want a step-by-step writing plan that’s REALISTIC? Need a strategy for creating content that readers love? Ever wish you had a best-selling eBook? Digital publishing has quickly become THE way to make money with your words. The problem? It’s not the ‘get rich quick’ strategy claimed by many gurus. The secret is to write the kind of nonfiction eBooks that build long-term fans and BUYERS. 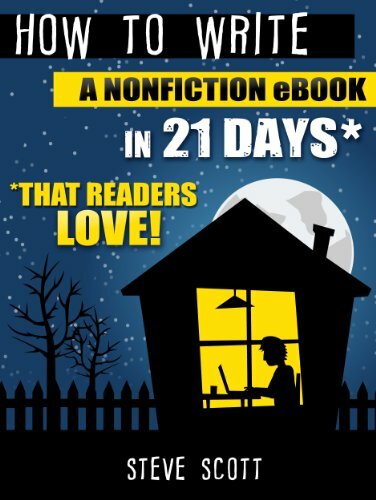 In the guide “How to Write a Nonfiction eBook in 21 Days,” you’ll get a day-by-day blueprint that actually works. Unlike other ‘systems,’ you’ll discover a strategy which includes realistic timelines and specific steps. Another lie the gurus love to tell is how “easy” it is to write an eBook. You should NEVER use Private Label Rights (PLR) articles. And writing an eBook isn’t about regurgitating another author’s hard work. What you need is a system that shows you how to write a book fast, while providing information that changes people’s lives. That’s how you win with nonfiction books! Write an Rough Draft Fast — (Day 5 to Day 8). You can write an eBook in 21 days! Just follow this blueprint and you’ll learn a proven system for writing fast. Download now and start writing your book TODAY!